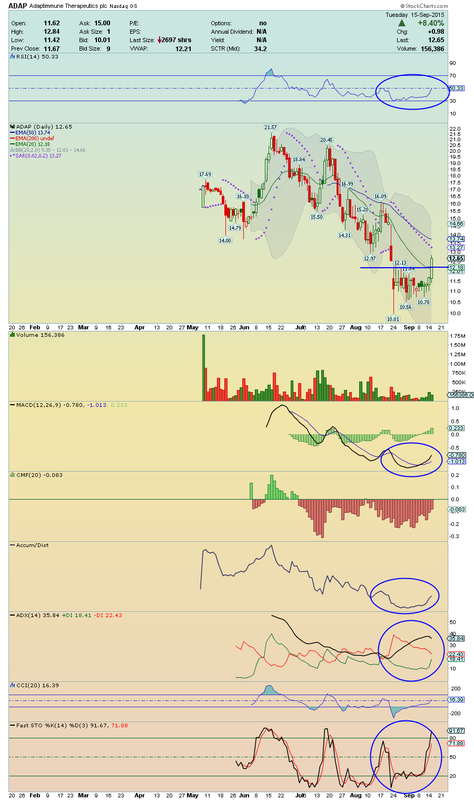 ETRM ---> This stock made today a powerful trade session, a strong breakout, and yet, it crossed above its 20EMA and above its Upper Bollinger Band Line with decent volume! Also, it closed near at High of the Day, becoming so, in a Gapper Candidate!! The Momentum seems strong, as we can see in some technical indicators, and for tomorrow i expect another strong trade session with initial target its 50EMA for a test!! Stay Tuned!! TTPH ---> Trading now inside of its Big Gap with the third day in a row of massive volume and High Accumulation, this Bottom Bounce seems ready for a strong upward movement!! I believe that it can reach the $12 level quickly and that's what i'll be watchful tomorrow!! I´m long on this one!! ADAP ---> This stock, with 73.02% of Short Float and after it have made today a strong trade session and a strong Breakout, we can expect an imminent Epic Short Squeeze!! Next key level to watch very closely is its 50EMA!! If it reached, and break above it on volume, Shorts will not resist to the pressure and will certainly cover strongly their positions!! 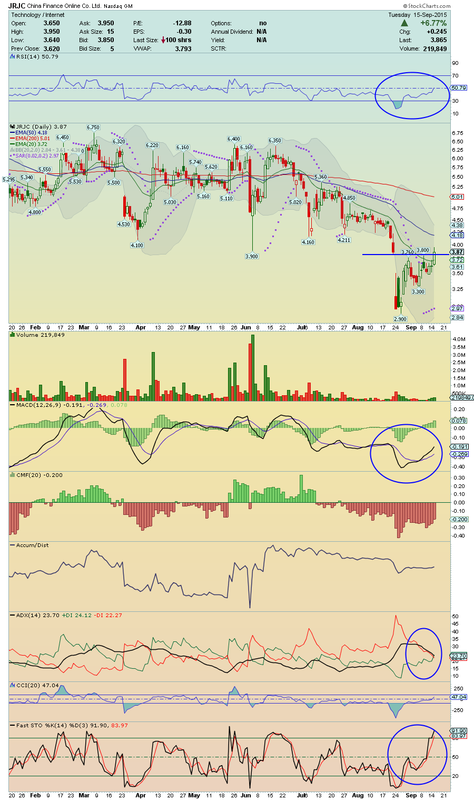 Chart indicators are giving strong Buy Signals and a increase of its Accumulation!! Buyers are in charge here!! Keep closely!! 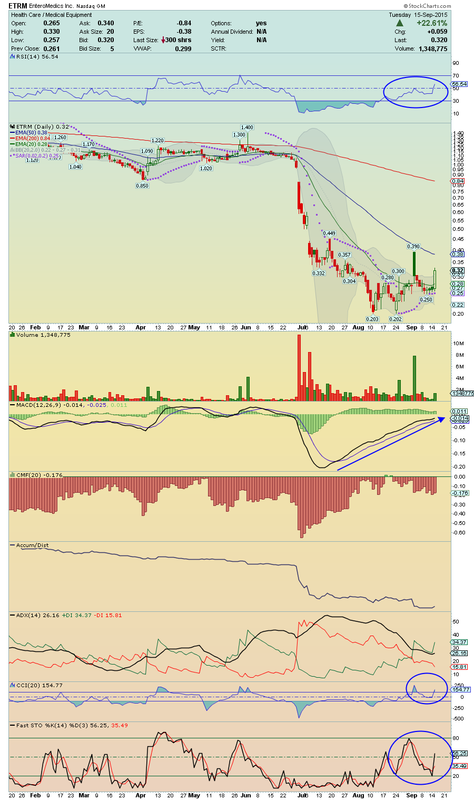 JRJC ---> Nice Gap Filled and nice Breakout today with decent volume!! This stock is setting up for more Upside Run and its 50EMA could be the next test!! Chart looks strong, with a nice Bullish ADX Crossover, showing that price is well sustained, or its RSI and its Bullish MACD Crossover, which are giving a strong Buy Signal!! Nice Momentum that worth be watching!! 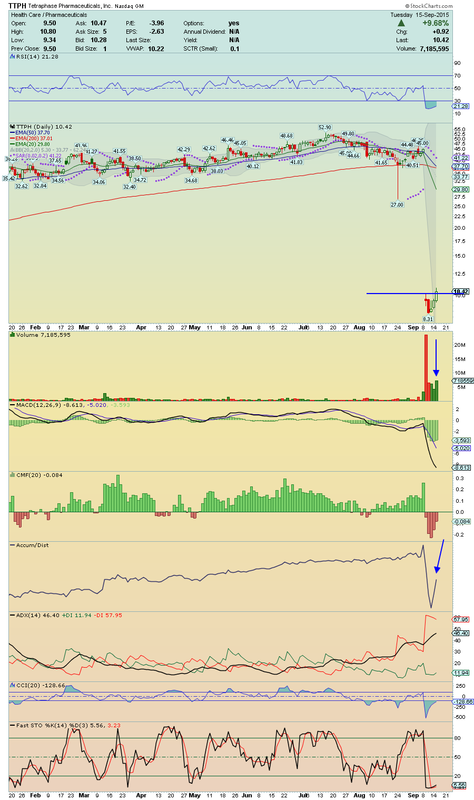 JOY ---> This Bottom Player gave today strong signs for a possible strong Bounce! Shares rose +5.55% with high volume, closing at High of the Day! This Gapper Candidate for tomorrow has all indicators curling up, some are even coming out of its oversold areas, meaning that buyers are back!! I´ll be watching for continuation of this performance!! 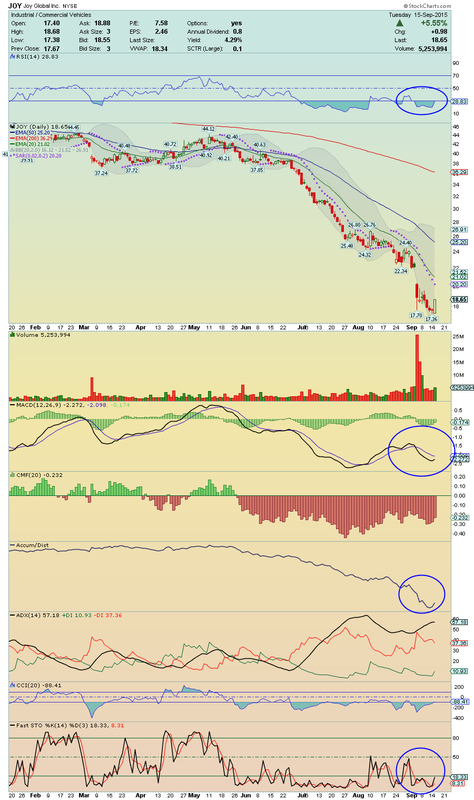 It has 20.57% of short float, which can also help the climb, giving us a nice squeeze toward its 20EMA!! The Momentum is growing!! Keep closely!! JMBA ---> Trading now above all EMAs, a break above its Upper Bollinger Band Line with high volume will open the door for a possible Short Squeeze, as it has 25.05% of Short Float!! 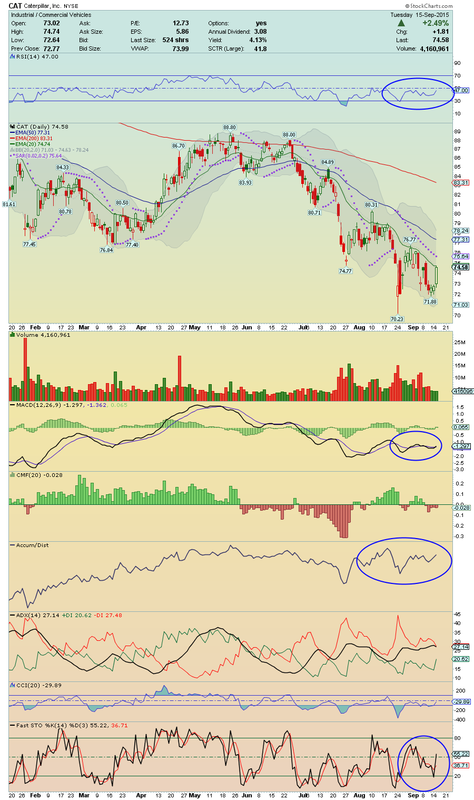 Chart is showing strong positive divergences, meaning that Bulls are in command! 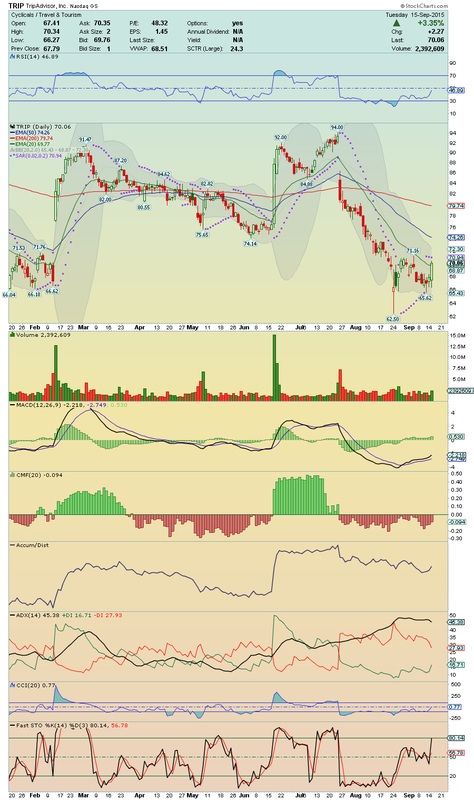 Could be a great long idea over $14.86!! 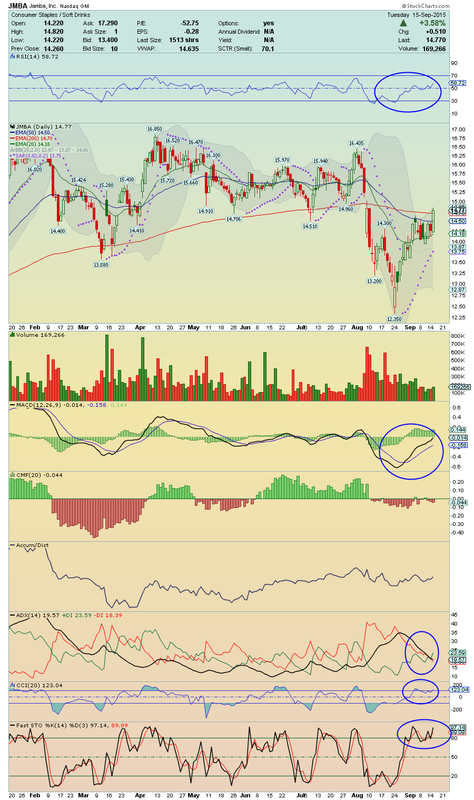 TRIP ---> This stock seems ready to leave the bottom and a breakout over $71.16 could boost it for a strong upside movement toward its 50EMA!! Chart indicators are looking strong, with a nice Bullish MACD and Fast Stochastic Crossovers giving a strong Buy Signal, Accumulation is rising again, and its RSI is moving up strongly toward its Buying Area!! The Momentum is growing and its 11.89% of Short Float could be an important help to the climb!! Worth Watching! !